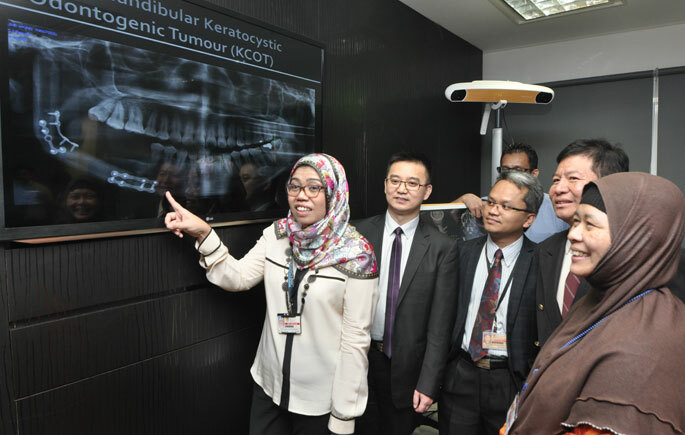 KUALA LUMPUR, 19 April 2017 – Universiti Kebangsaan Malaysia Medical Centre (UKMMC) successfully performed three breakthrough jaw reconstruction surgeries, with the help of computerized Assisted Surgery Navigation (NAS), to remove growths on the jaw or craniofacial bone. UKMMC Oral and Maxillofacial Surgeon, Prof Madya Dr Mohd Nazimi Abd Jabar said patients who have a tumour of the jaw bone or craniofacial mostly need to undergo surgery to remove the tumours and that caused the defect or deformation on the patient’s structure of the face, jaw and patient’s jaw functions. “The technique, which is known as free-flap surgery (fibula tissue surgery), is not a new technique in our country and is offered in most of the general hospitals. 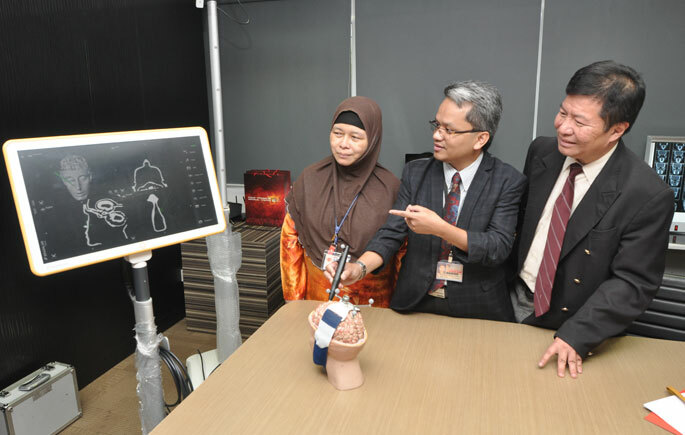 “However, UKMMC is one of the first hospital in Malaysia to perform the jaw reconstruction surgery, utilising a combination of few surgical techniques, namely free-flap and NAS,” he said at the Press Conference, recently. He said the first surgery, headed by Prof Peng Xin, who is the UKM Adjunct Professor from the Peking University, School of Stomatology was successfully carried out on 29 June 2016. To date, PPUKM has successfully conducted three surgeries and the result is very satisfactory. “This surgery involves meticulous and intense planning because it combines detailed analysis of the tumour or jaw deformation tumour, 3-dimensional printing technology and the consolidation of data and images into the computer navigation system. “This is to ensure that the results of the surgical planning are transferred accurately during the actual surgery,” he explained. He said although this technique requires an overall cost of about RM30,000, it can reduce the overall healing time and results in better surgery aesthetics and functions compared to conventional techniques. One of the patients, Caroline Wong, 28, who did the surgery to removes growths form her jaw said she chose to do it at UKMMC because she confident with the NAS technology, utilised. “It only took about three months for my jaw to heal,” she said. Also present at the Press Conference is UKM Faculty of Medicine Dean, Prof Dr Zaleha Abdullah Mahdy and Head of UKM Advance Surgical Skill Centre, Prof Madya Dato’ Dr Hanafiah Harunarashid.